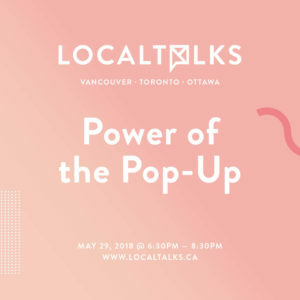 Last week, I attended a discussion by local (Ottawa) entrepreneurs on the topic of “Power of the Pop-Up: Creating a Lasting Impression in a Temporary Space”. The panelists represented a variety of business owners who work in the maker/artist environment. I was attending with my mind on two different contexts – Pop-Up Escape Rooms and my Etsy business – Mini Escape Goat Buttons. It was an awesome talk and I spent more time thinking about applications to the pop-up escape rooms than buttons, but that’s okay because now I want to share my notes and thoughts with you! Prepare for a ramble of unofficial quotes from the awesome speakers and my thoughts on their usefulness to pop-up escape rooms. So What is a Pop-Up Shop? Well, it’s a quick brief chance to draw in customers. It’s a way to show off your product to your market and make them want to seek you out to get it again. What’s a Pop-Up Escape Room? You need to provide an honest experience, as you’re likely dealing with 1 customer at a time. With an escape room, it’s more like 3-5 players at a time but the sentiment holds. You have only a few minutes to form an impression on these new players. Give them your dedicated attention and wow them with your game! There was some argument over this, but I appreciate the idea. Don’t overwork your idea to death. Just build something that’s quick to setup and get it out there so potential customers can enjoy it. Make do with your space and decide where you are going to devote your time and energy. Give Them Something To Share – Make It Instagram Friendly! Build a photo wall, make your space pretty, and encourage visitors to post on Instagram and tag you! More escape rooms need to embrace this. A pop-up game can still have photo props and you should set a space (with a pretty backdrop and not just the crowd) where players are encouraged to pose. The idea being that everyone searches your company name on Google as their first step before visiting you. And it’s absolutely true. So you need to develop an online presence. There are few things worse than searching for a company and not having anything come up in Google. This means website, this means social media accounts, this means just getting out there and being written about online. Less Competition – More Collaboration! The panelists talked about working with “competitors” or “colleagues” to share ideas and promote each other. I could write a whole blog post on how the escape industry needs to wake up and get better at collaboration and support. Encourage each other to be better, and recommend other companies in your area! More awesome games means more interested players! Speaking about renting out mall spaces or storefronts for short-term rentals, the panelists encouraged going for it! What do you bring to that space? How do you both (landlord and you) benefit? In many malls, a % of sales goes back to the mall on top of a lease payment. But if you don’t ask or counter-offer on parts of the lease agreement you don’t agree with, then you won’t know what is possible. The panelists stressed, don’t be intimidated by landlords and know where your line is. This can apply equally to attending a convention as a pop-up escape room or negotiating a storefront lease. Below are samples of the Insta-fabulous panelists’ businesses. Yup! Love this #local super talent @strutjewelry. Phenomenal jewellery from a phenomenal lady. Meet her at the @magpiejewellery locations this weekend! . . . #shoplocalottawa #shopottawa #ottawashopping #loveyourlocal #ottawamakers #strutjewelry #magpie #magpiejewellery #trunkshow #ottawa #rideau #glebe #westboro P.S. it's been a while Ottawa… I missed u. Really just the best example of an Instagram friendly backdrop. This Heartwall is incredible.